If the free trial or the registration period is expired, the system will lock itself. In these cases you have to register your system or you have to extend the registration. 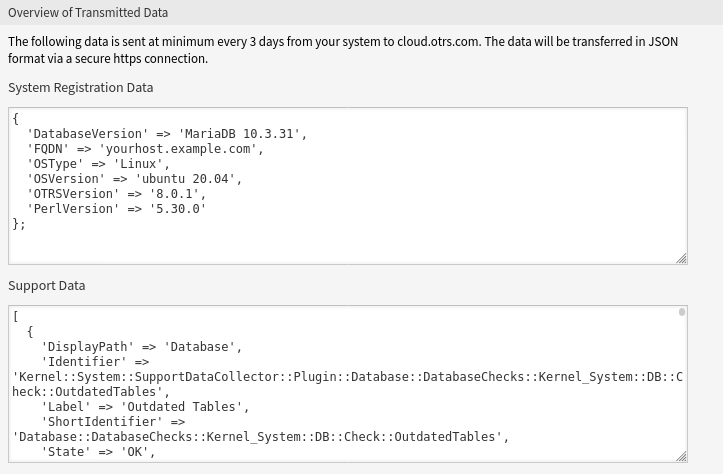 Use this screen to register your system with the OTRS Group. The registration screen is available in the System Registration module of the OTRS Group Services group. Obtain an OTRS ID. You have to register in the OTRS Portal. After the registration you will get your OTRS ID. Go to the System Registration module of the OTRS Group Services group, and enter your OTRS ID and your password. Select the system type and enter a description. Click on the Edit details button in the left sidebar. Modify the system type and the description. Review the data in JSON format. Detailed explanation of the fields is available in the Support Data Collector chapter. Click on the Overview of registered systems button in the left sidebar. Log in to the OTRS Portal. Review the list of registered systems. Click on the Deregister system button in the left sidebar. You can’t deregister your system if you’re using the STORM powered by OTRS™ or having a valid service contract.